Climate change heat waves won't make Persian Gulf uninhabitable. New research shows parts of the Middle East could experience unprecedented heat waves if climate change continues unabated. 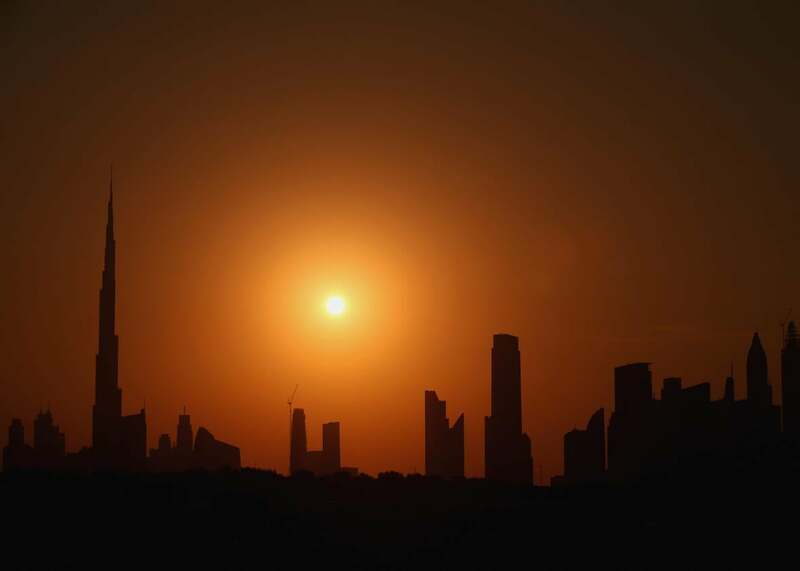 Here, the sun sets behind the city skyline, Nov. 16, 2013, in Dubai, United Arab Emirates. On Monday, a shocking new research study from researchers at the Massachusetts Institute of Technology confirmed what climate scientists have long suspected: If humans continue on a business-as-usual path, by the end of this century, extreme heat waves in some parts of the planet will be outside the range of previous human experience. As in, no human that has ever lived has ever experienced heat and humidity this brutal. So hot that, in fact, it might be physically impossible for a healthy person, in the shade, to survive outdoors. Our bodies simply aren’t built to cool properly when the wet bulb temperature—an indicator of humidity that matches the temperature of our skin when we sweat—rises above about 95 degrees Fahrenheit. At that point, humans just can’t sweat enough to cool down. Ninety-five degrees might not seem like a lot, but it’s incredibly high on the wet-bulb scale. In July of this year, Bandar Mahshahr, Iran, hit a heat index of 165 degrees Fahrenheit for a few minutes with a wet-bulb temperature of 94.5 degrees. The study’s conclusions focused on human health: specifically, the likelihood that the 95-degree wet-bulb threshold would be breached for a single six-hour period—possibly fatal if you stayed outside that whole time—during the hottest months in the year over a 30-year period in one of the hottest places in the world, the Persian Gulf. The research predicts that the threshold may be exceeded, perhaps once a decade or so, by about 2100 in places like Dubai, Abu Dhabi, and along parts of the Iranian coast. So we are talking about very, very hot temperatures, yes—but not on a sustained basis. Even the New York Times, whose coverage of the research was perhaps the most widely shared, waited until the 10th paragraph to mention that these deadly conditions would be relatively rare, even in a worst-case climate change scenario. Elfatih Eltahir, one of the study’s co-authors, isn’t pleased that his research is being exaggerated: “I’m learning my lesson in dealing with the media,” he told me Tuesday. However, much of the initial coverage might give the impression that Dubai would soon become a post-apocalyptic desert wasteland, where inhabitants might be forced to wear some sort of space suit to survive. There’s a huge difference between a single six-hour period over a span of 30 years, and everyday summer conditions that are deadly for those who venture outside. The latter, of course, would make cities uninhabitable, the former likely wouldn’t. Indeed, the sort of conditions the research describes are already nearly here, if only very occasionally—like the heatwave that hit Bandar Mahshahr. Cities in the region have grudgingly adapted to these occasional conditions, and their populations are still growing. Electricity is subsidized, and air conditioners are commonplace. Of course, those without access to air conditioning—likely the poorest—are especially vulnerable and will grow more so as the climate warms. Eltahir specifically mentioned the Red Sea coast of Yemen, where there is extreme poverty, as a place that might remain particularly vulnerable under any climate scenario. Like I wrote earlier this month, it’s incredibly harmful when good research like this gets transformed into apocalyptic headlines. Climate change is bad enough—there’s no reason to exaggerate what we know about it. What’s worse, Eltahir’s research, like the news of impending ice shelf collapse in Antarctica, which inspired my other article, was a well-designed study intended to highlight the choice that’s still possible for humanity. We could continue on our present course, in which the climate system seems to push past absolutely critical thresholds that risk destabilizing human civilization. Or we can pursue a much milder scenario in which greenhouse gas emissions are sharply reduced. “With mitigation, these events will be significantly less severe,” Eltahir said. Journalism that exaggerates climate change does so at the risk of being counterproductive, and we just can’t afford any more setbacks at this point—we’ve already waited long enough for effective climate change action.